As NBA Summer League play continues in Las Vegas for the next few weeks, all eyes are to the end of the month when the USA Basketball team kicks off a two day mini camp which will showcase a solid veteran coaching staff and team that is stacked for the 2020 Olympic games. USA Basketball took some solid steps and adding a few coaches prior to the start of the mini camp that have solid leadership both at the NBA level and have won a national title at the NCAA level in Jay Wright. Named to assist USA National Team head coach and San Antonio Spurs mentor Gregg Popovich at the USA minicamp were: Golden State Warriors associate head coach Mike Brown; Miami Heat assistant coach Dan Craig ; Gonzaga University head coach Mark Few; Utah Jazz assistant Alex Jensen; Boston Celtics assistant Jay Larranaga; Dallas Mavericks assistant Jamahl Mosley; San Antonio Spurs assistant Ime Udoka; Portland Trail Blazers assistant David Vanterpool and Villanova University head coach Jay Wright. The USA National Team minicamp will feature practices 12-2 p.m. (PDT) on July 26 and 27 at UNLV’s Mendenhall Center. “As we prepare to conduct our first USA national team training camp in the 2017-20 quadrennium, we’re excited about having our available national team players participate in the July 26-27 minicamp and we have compiled a truly outstanding, high-energy coaching staff that will assist national team head coach Gregg Popovich,” said USA Basketball Men’s National Team managing Director Jerry Colangelo. Thirty-five NBA players were named on April 6 to the 2018-20 USA National Team roster. The list included 11 gold medalists from the 2016 Rio Olympic team, seven 2012 London Olympics gold medalists, eight members of the gold medalist 2014 FIBA World Cup Team and five players who were members of the 2010 USA team that captured the FIBA World Cup title. With the solid coaching staff, this could be the best team the USA has fielded in a number of years and even better than the one from 2012. The complete roster is below. 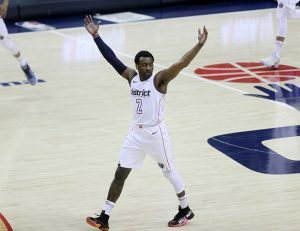 Members of the 2018-20 USA National Team are: Harrison Barnes (Dallas Mavericks); Bradley Beal (Washington Wizards); Devin Booker (Phoenix Suns); Jimmy Butler (Minnesota Timberwolves); Mike Conley Jr. (Memphis Grizzlies); DeMarcus Cousins (Golden State Warriors); Stephen Curry (Golden State Warriors); Anthony Davis (New Orleans Pelicans); DeMar DeRozan (Toronto Raptors); Andre Drummond (Detroit Pistons); Kevin Durant (Golden State Warriors); Paul George (Oklahoma City Thunder); Eric Gordon (Houston Rockets); Draymond Green (Golden State Warriors); Blake Griffin (Detroit Pistons); James Harden (Houston Rockets); Tobias Harris (Los Angeles Clippers); Gordon Hayward (Boston Celtics); Kyrie Irving (Boston Celtics); LeBron James (Los Angeles Lakers); DeAndre Jordan (Dallas Mavericks); Kawhi Leonard (San Antonio Spurs); Damian Lillard (Portland Trail Blazers); Kevin Love (Cleveland Cavaliers); Kyle Lowry (Toronto Raptors); CJ McCollum (Portland Trail Blazers); Khris Middleton (Milwaukee Bucks); Victor Oladipo (Indiana Pacers); Chris Paul (Houston Rockets); Isaiah Thomas (Los Angeles Lakers); Klay Thompson (Golden State Warriors); Myles Turner (Indiana Pacers); Kemba Walker (Charlotte Hornets); John Wall (Washington Wizards); and Russell Westbrook (Oklahoma City Thunder).